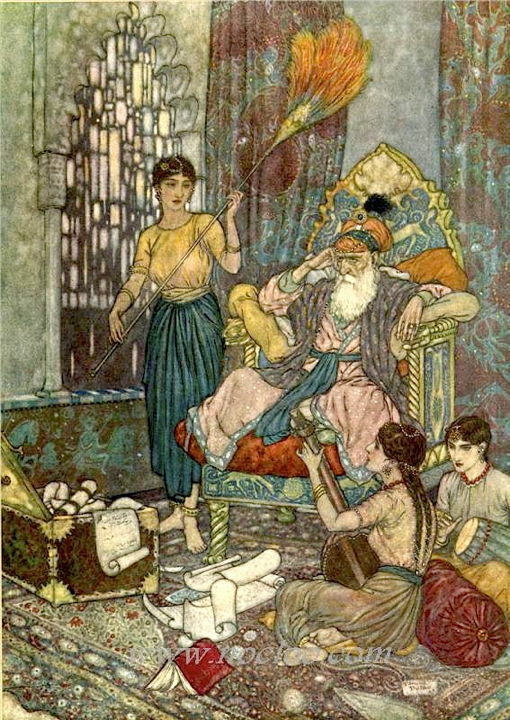 From the very earliest days of printing until the present, books in the Western world have frequently featured illustrations depicting Mohammed. 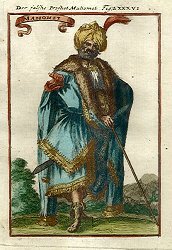 Since there has never been, in non-Muslim lands, a prohibition against depicting Mohammed, authors, publishers, editors and illustrators have always felt free to depict Mohammed whenever and wherever it was appropriate, in books dating as far back as the 1400s all the way up to the 21st century. This section of the Mohammed Image Archive focuses exclusively on illustrations of Mohammed that have appeared in printed, bound, textual books, starting with the invention of movable-type printing in 1454 A.D.
For illustrations of Mohammed in handwritten manuscripts and other types of non-printed documents or folios from the Middle Ages prior to 1454, visit the European Medieval and Renaissance Images section of the Archive. For illustrations of Mohammed on the covers of books, visit the Book Covers section. For illustrations of Mohammed in comic books and other types of illustrated pamphlets or booklets that are mostly or entirely imagery (as opposed to text), visit the Comic Books section. The entries below are presented in chronological order. 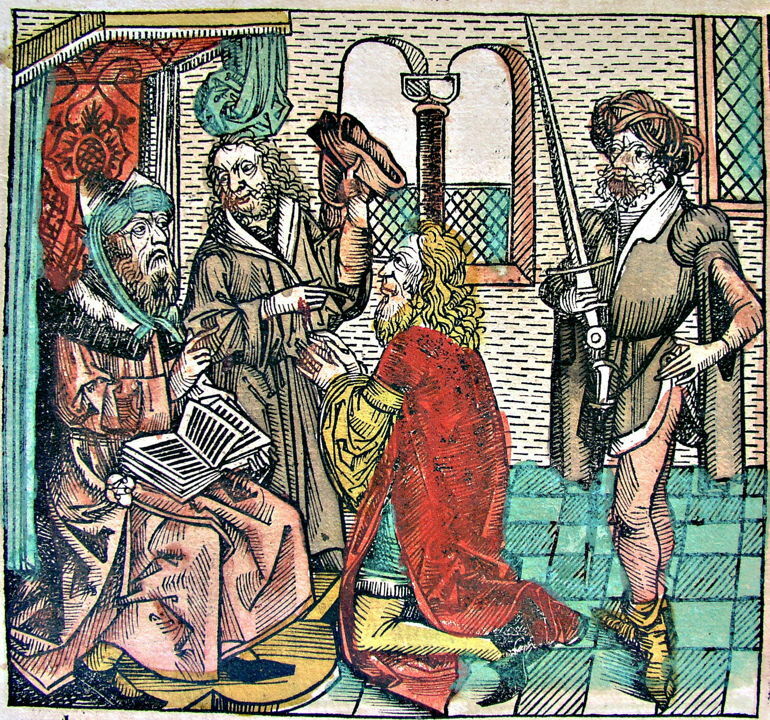 One of the earliest of all printed books, the The Nuremberg Chronicle from 1493 A.D., featured a full-color woodblock illustration of Mohammed receiving visitors at court. The first image above shows the entire two-page spread with the illustration in context (upper left). 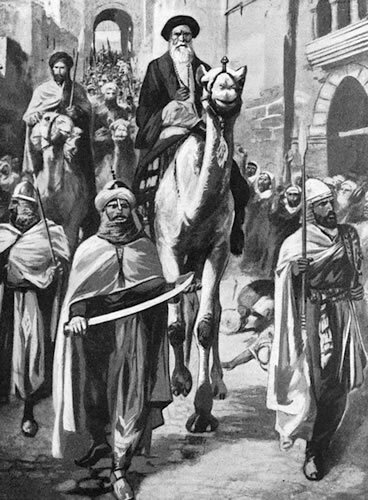 The second image shows the full illustration, with Mohammed seated at left. The third image is a close-up of just the full Mohammed figure, and the fourth image is an extreme close-up of just Mohammed's face. The wildly inaccurate fashions of all the figures in the image might lead one to suspect that the "Mohammed" depicted is instead a later historical figure also named "Mohammed" -- but the English translation of the original Latin text on the page confirms that the "Mohammed" being depicted is indeed the 7th-century founder of Islam: "Mohammed (also Muhammad and Mahomet), great lawgiver of the Arabs, and founder of a religion that has prevailed over large portions of Asia and Africa for 14 centuries - was born at Mecca in 569. He belonged to one of the most illustrious families of Arabia..." etc. 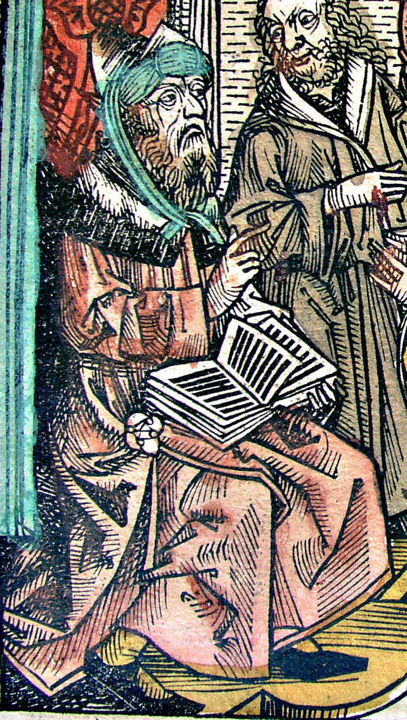 The full Nuremberg Chronicle describes all of world history up until 1493, along with explanations of biblical passages, and was written by 15th-century German historian Hartmann Schedel. 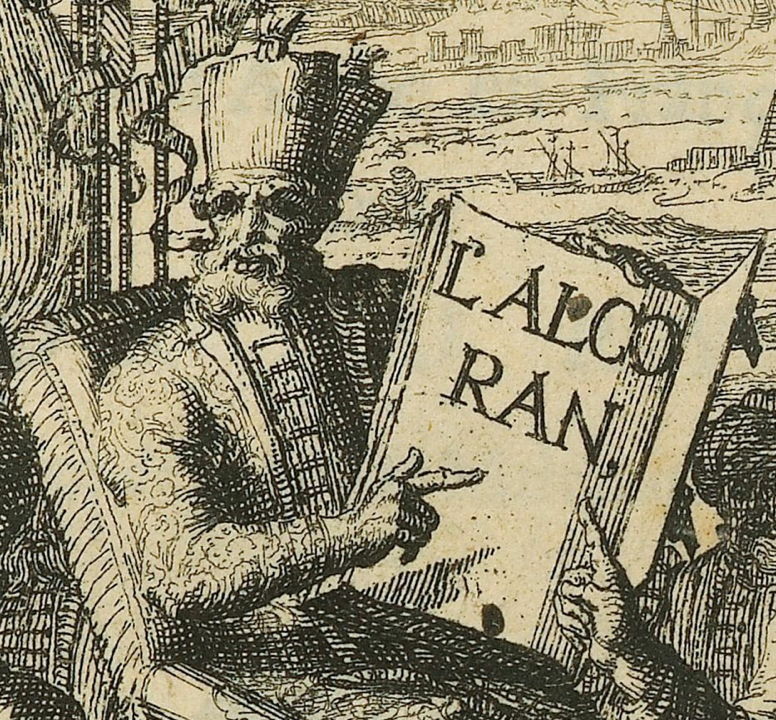 Its official title is actually Liber Chronicarum, but it is almost always referred to as The Nuremberg Chronicle, after the city where it was produced. The woodblock prints were prepared by the workshop of Michael Wolgemut, amongst whose employees at the time of the book's preparation was famed artist Albrecht Dürer. All of the images shown here were found at the Web site devoted to the Nuremberg Chronicle hosted by Morse Library, Beloit College, in Wisconsin. 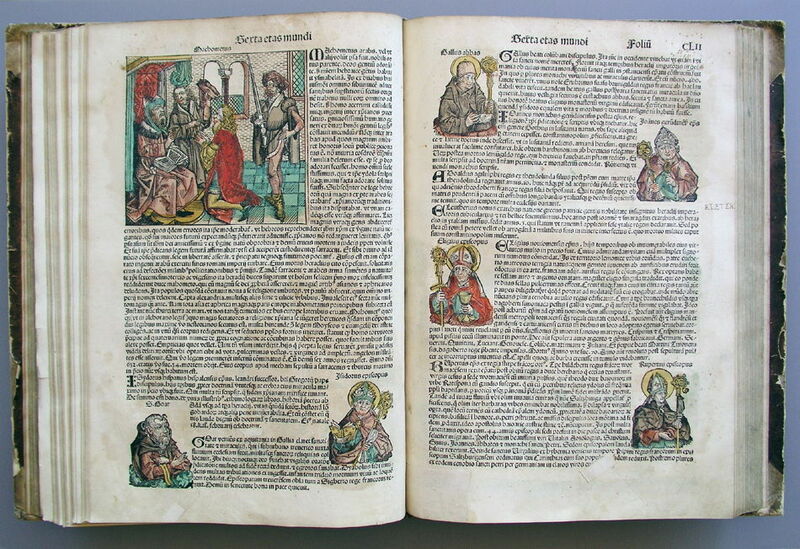 The photograph of the full two-page spread, which is Folio pages CLI (151) verso and recto, can be found here. The full-size high-resolution image of the woodblock illustation is visible here. 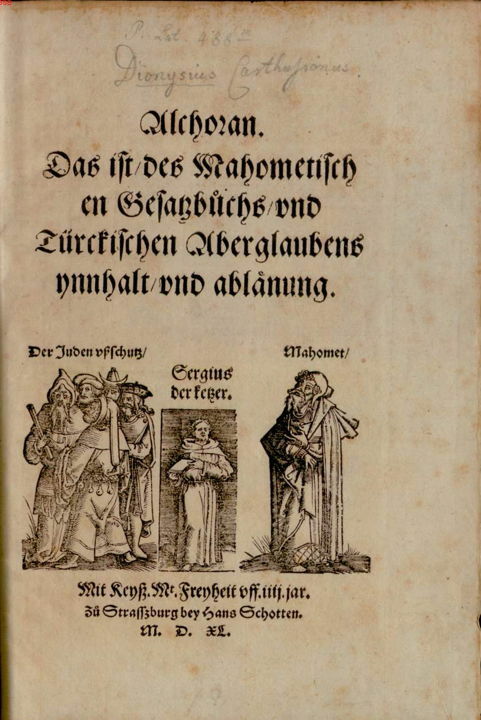 In 1540, a partial translation by Dionysius Cartusianus of the Koran into German, entitled Alchoran, das ist des Mahometischen Gesatzbuchs und Türckischen Aberglaubens Ynnhalt und Ablänung (which can be translated loosely as "The Koran, which is the Muslim Legal Code, and Rejection of the Turkish Superstition"), was published in Strasburg, Alsace, and which contained on the title page a full-body portrait of Mohammed. The image on the left is the complete page; the image on the right is a close-up of the Mohammed figure. The entire book (including this page) can be found here at the Munich Digital Library. The book contained the first partial translation of the Koran into early German, as well as various attempted refutations of Islamic scripture. 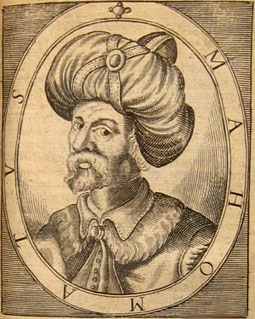 Portrait of Mohammed from Michel Baudier's Histoire générale de la religion des turcs (Paris, 1625). It was sold at auction by Sotheby's in 2002. The same image was incorporated into the cover of issue #2195 of the French magazine Le Nouvel Observateur. This early Dutch-language history of Islam, which translates as "The History of the Origin, Family, Birth, Education and Teachings of the Great False Prophet Mohammed," contains at least three engravings which depict Mohammed, and possibly as many as six. All are presented below, and were found in the digitized version of the book made available online here at Google Books. A few of the pictures, although in lower resolution, are also visible here, here, here and here at wikimedia. 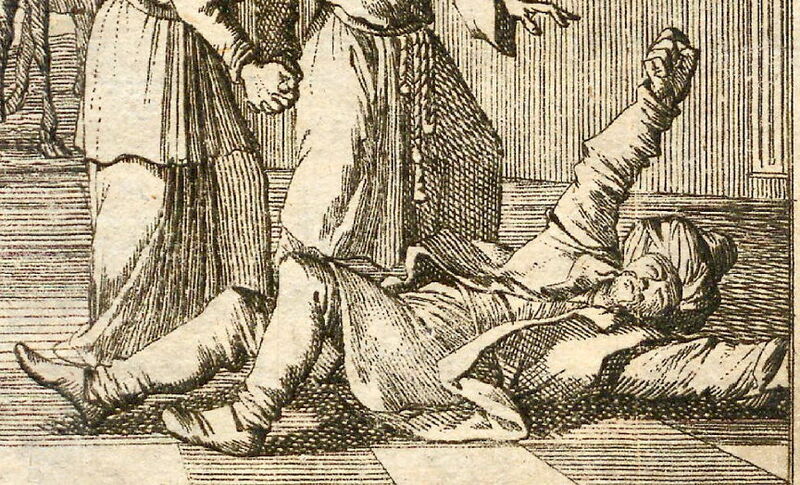 This is the first of two engravings illustrating the book which depict Mohammed having an epileptic fit. During this era, one of the new "debunkings" of Islam was to claim that he did not actually receive the word of God through the Angel Gabriel, but simply hallucinated during epileptic seizures. Such an explanation in retrospect seems "obvious" and is commonly surmised by 21st-century commentators, but in the 17th century it was a novel and cutting-edge theory. 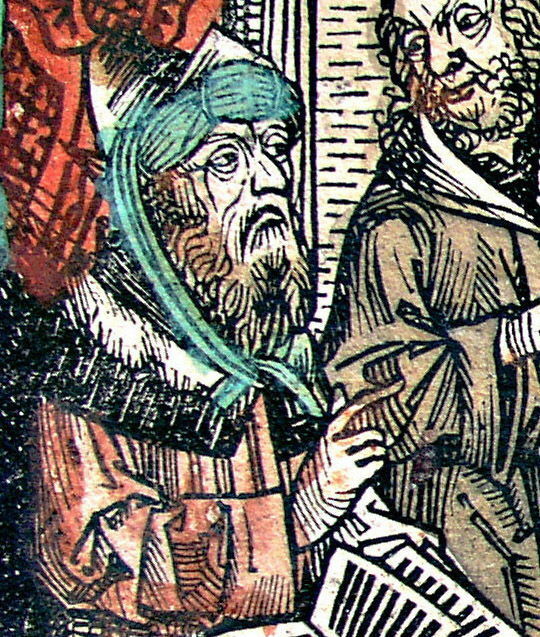 A detail of the previous image, showing just Mohammed. 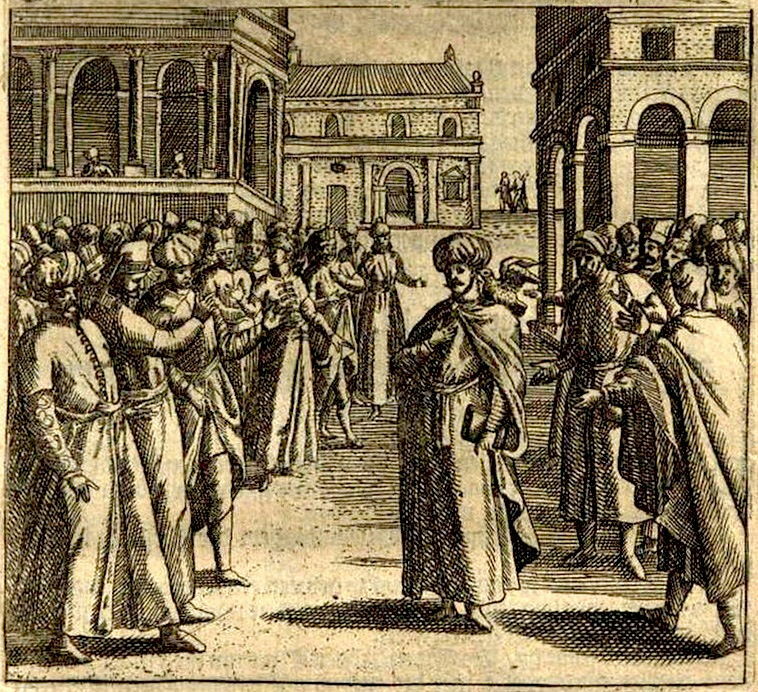 The second illustration of Mohammed receving a "vision" during an epileptic fit -- in this case in front of witnesses. 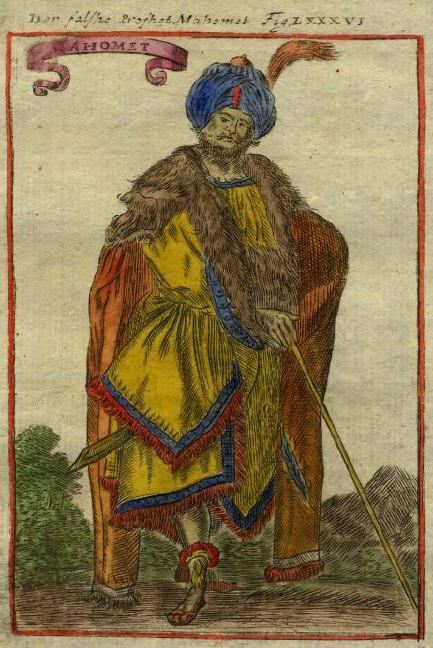 As in all the illustrations for this book, the clothing of all the human characters is contemporary to the time of its publication (1640) rather than the time and place depicted (the 7th century Arabia). The dove on the shoulder of the figure in the center indicates that it is Mohammed. In Christian iconography from the era, false prophets are often depicted being associated with a dove, which represents the Holy Spirit, and which the false prophets display to fool onlookers that they have a relationship with God. The remaining three illustration may or may not be depictions of Mohammed. 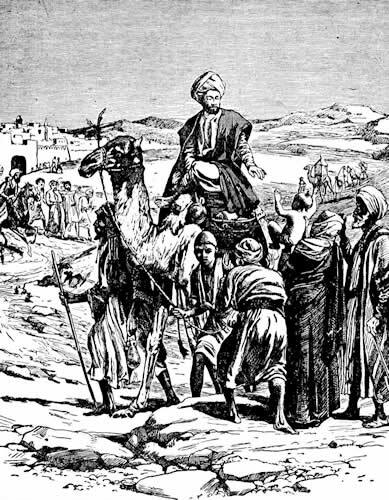 An illustration early in the book shows a young boy being sent off to live in the wilderness -- which is exactly what happened to Mohammed. However, the completely inappropriate landscape, architecture and costumes cast some doubt on this identification. The only way to be sure would be to translate the early Dutch text. This scene depicts not Mohammed directly but instead his casket, which contains his dead body. 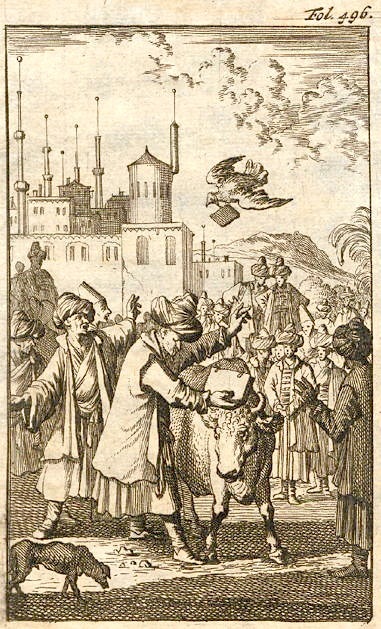 The engraving illustrates a passage in the book which debunks a supposed "miracle" in which Mohammed's casket is supposed to have levitated; the author of the book claims that the trick was done with magnets. Finally, the very first page of the book, which features a slightly different title ("Oorspronck, Geslacht, Geboorte, Opvoedinge en Leere van Mahomet. 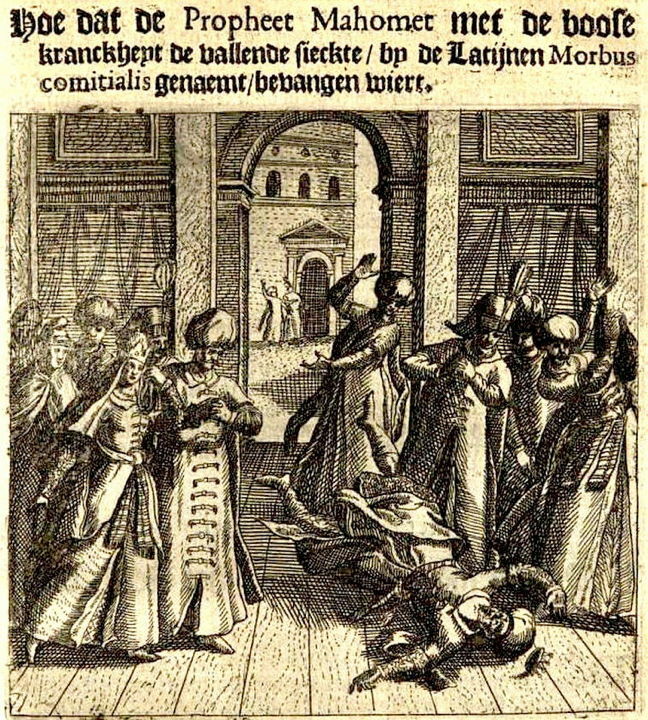 Oock hoe verre en breet hy sijn rijck onder de Turcken verbreydet heeft") than the one presented on the actual title page, contains this frontispiece with a warrior leading a cavalry charge. 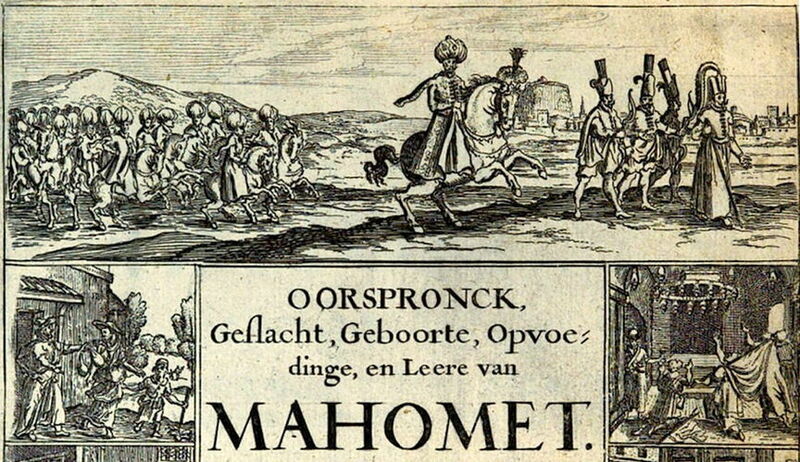 On one hand, since this is a biography of Mohammed, it would make sense to conclude that the figure on the horse is Mohammed; but on the other hand, since the figure is wearing the uniform of a 17th-century Turkish military commander, and is surrounded by Ottoman Jannisary troops, and since the full title of the book references the spread of the "Turkish Empire," then it is more likely that this image depicts not Mohammed but some later Ottoman military figure. 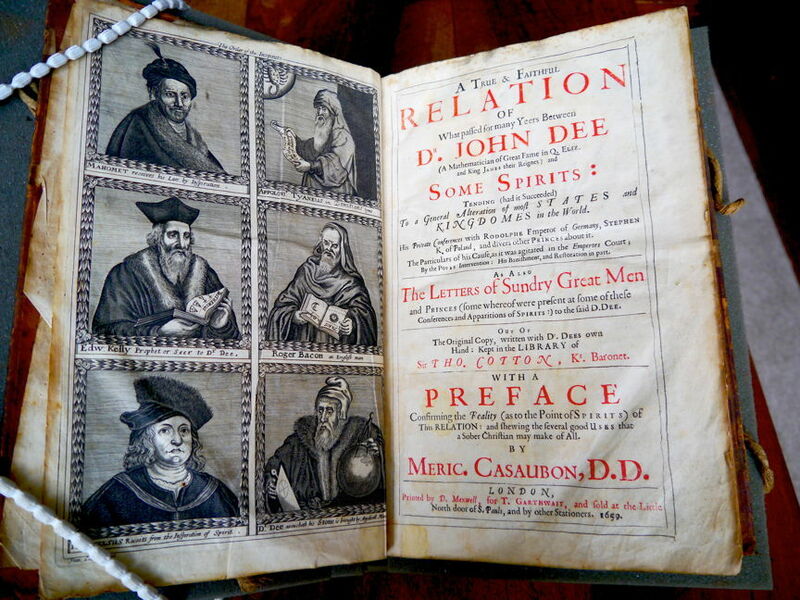 A True and Faithful Relation of What Passed for Many Yeers Between Dr. John Dee and Some Spirits, written by Meric Casaubon and published in London in 1659, has on its frontispiece a portrait of Mohammed as first among the many dead "spirits" who communicated wisdom to the 16th-century mystic John Dee. The picture at the top right shows the Mohammed portrait straight-on; the picture on the top left shows the same portait in higher resolution, but photographed at a slight angle. (The white shape at the upper left is a strap holding the page open). The third image is the entire two-page frontispiece in full, in which the portrait of Mohammed is visible in situ at the upper left. The first and third images were found here at the Jesus College Libraries blog; the straight-on image was submitted by an Archive reader. 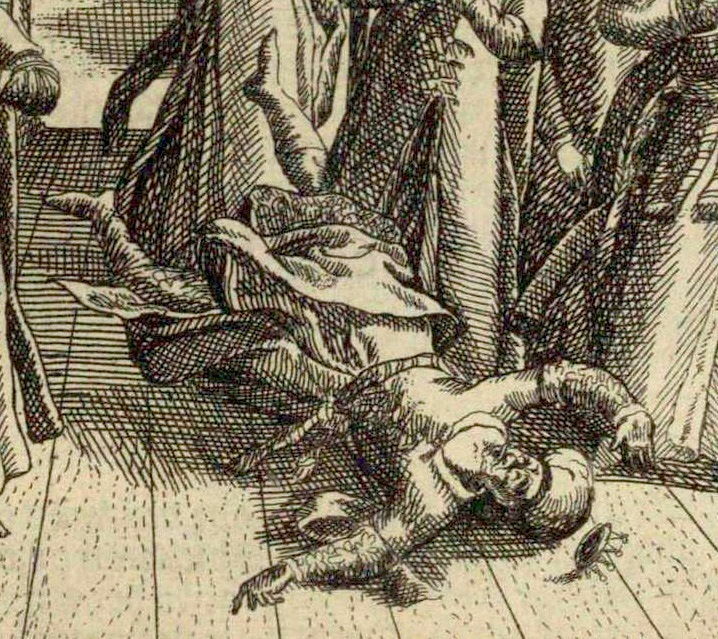 The book was issued as a reprint in 1974, which included all the same illustrations, but the versions presented here were all taken from the original 1659 edition. 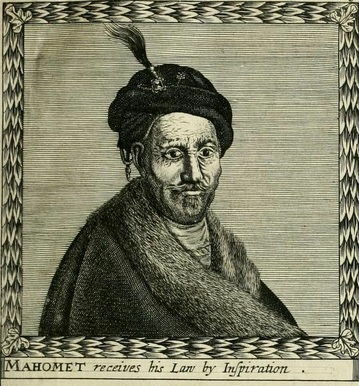 In the portrait, captioned "Mahomet receives his Law by Inspiration," Mohammed is wearing historically inaccurate garb and hair stylings, including a fur-lined cape and European-style mustache. 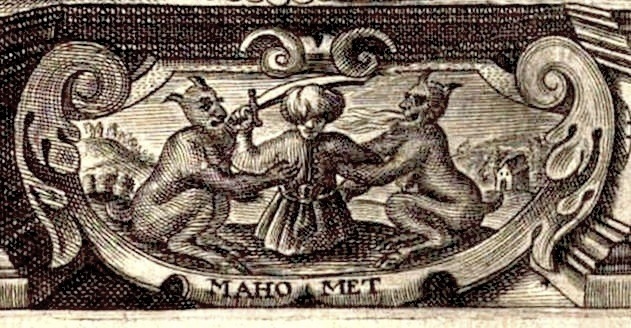 The frontispiece of the German book Mahomets und Türcken Grewel, published in Frankfurt in 1664, depicts Mohammed (in the bottom panel) being tormented by demons. The book is "An account of the wars between Austria and Turkey in the 1660's, prefaced by an account of Islam." 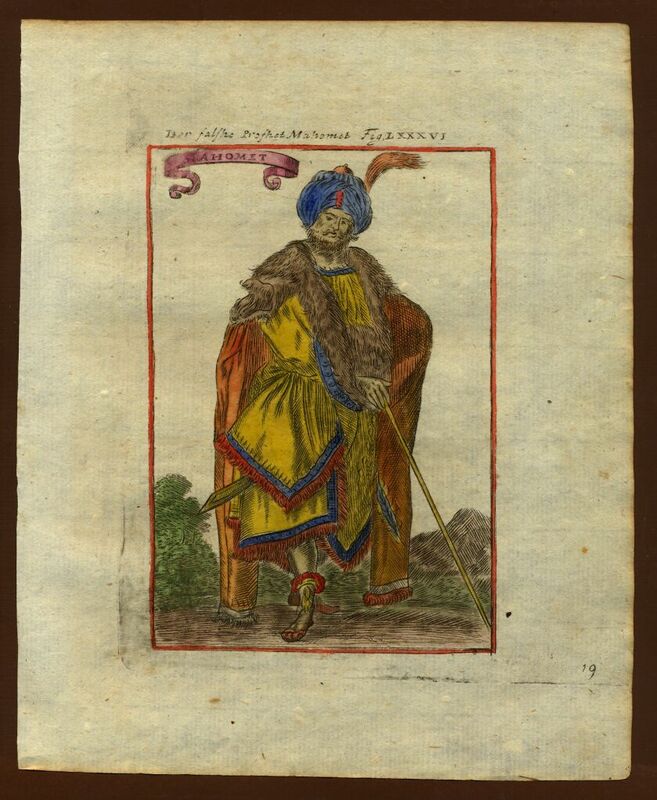 A digitized version has been put online here at Google Books. The pdf (46mb) of the entire book can be downloaded here. The image on the left is the full page; the image on the right is a close-up of the bottom panel showing Mohammed and the demons. 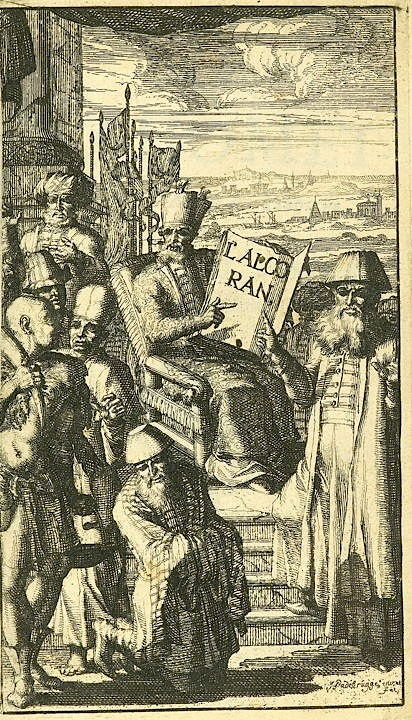 The 1683 edition of L'Alcoran de Mahomet, Traduit d'Arabe en François, Par le Sieur du Ryer, Sieur de la Garde Malezair ("The Koran of Mohammed, Translated from Arabic into French, by the Sieur Du Ryer, Lord of the Malezair Guard"), published in The Hague, Netherlands by Adrian Moetjens, contained this frontispiece illustration signed by "J. Padebrugge," which shows Mohammed holding and pointing to a copy of the completed Koran. This edition of the book was auctioned by Sotheby's in 2007, which is where the images above were found. This translation of the Koran by the Sieur Du Ryer was first published in 1647 in Paris, 36 years before the 1683 edition was released in the Hague. 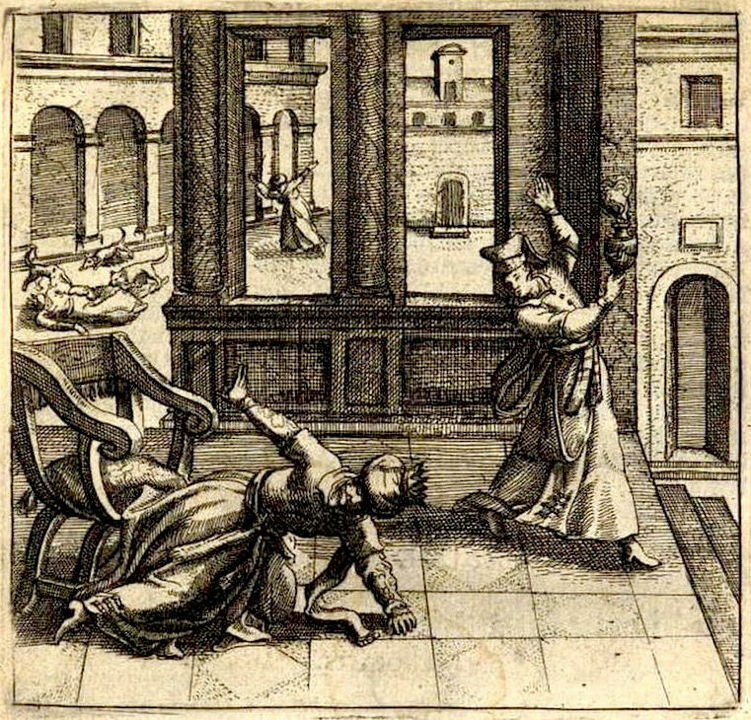 The 1647 edition had different illustrations. The top image shows the full frontispiece; the seond image is a zoomed-in closeup of just Mohammed, taken from the full scene. 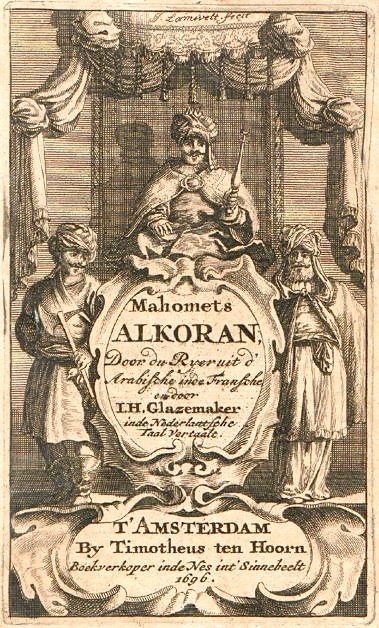 The image contains several factual errors, the most egregious of which is that the title of the book itself, as reflected in the frontispiece, means "The The Koran," since al Koran in Arabic already means "The Koran," to which the author and artist appended a second "The" with the French " L' " -- thus, "L'Alcoran" means "The The Koran." Furthermore, the Koran was not fully compiled until long after Mohammed had died, so there's no way he could be holding a finished copy of it while alive. Also, the post-Gutenberg style of bookbinding shown in the image did not exist in Mohammed's era, so he could not be holding a "book" in the format depicted. And lastly, as with most portraits of Mohammed made in Europe during this era, he and his companions are wearing clothing and headgear historically inappropriate for 7th-century Arabia. 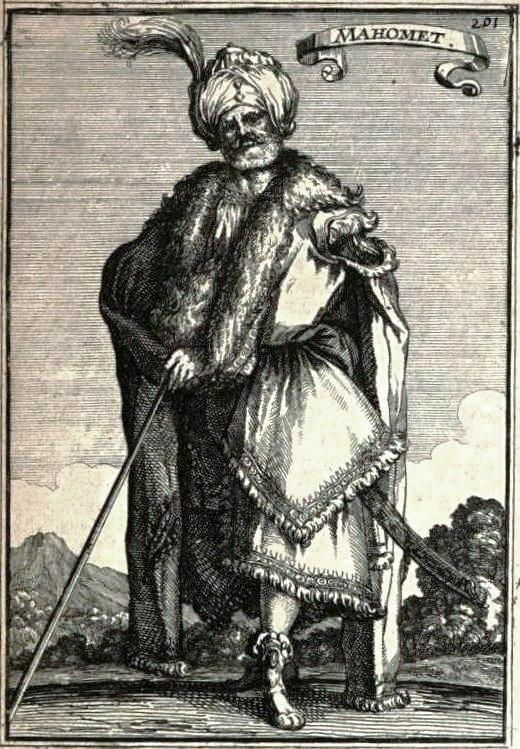 Portrait of Mohammed ("Mahomatus") which appeared in the book Pahsebeia, or A View of all Religions in the World, written by Alexander Ross and published in 1683. As noted in the Wikimedia Commons page where it was found, Mohammed's costume is anachronistic. 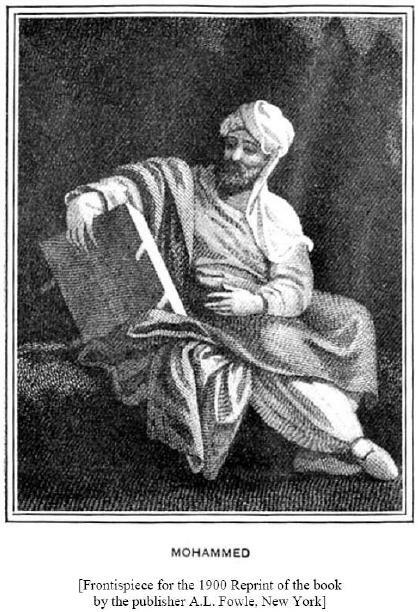 This detailed engraving of Mohammed was included as an illustration in the original 1683 edition of Alain Manesson Mallet's encyclopedia Description de l'Univers ("Description of the Universe"). The portrait of a regal figure in this exact pose apparently originated with an earlier etching made by Jacques Bellange ca. 1600 representing one of the Three Kings (Gaspard/Caspar), which portrait itself was then adapted by Matthäus Merian the Elder in 1615 to depict another of the Three Kings (Melchior), and finally re-adapted a second time by Alain Manesson Mallet with slight changes to represent Mohammed (or "Mahomet"). In all versions, the figure is wearing anachronistic 17th-century garb that neither Mohammed nor the Three Wise Men could possibly have worn. See below for further adaptations of the portrait. 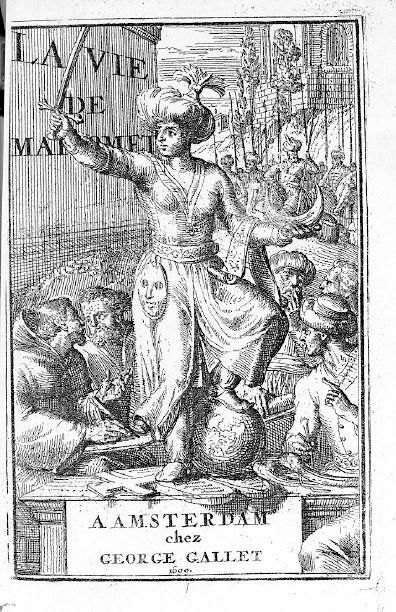 Mallet's Description de l'Univers was reprinted several times between 1683 and 1719. In the 1685 reprint, the exact same etching was reproduced as a black-and-white version only (as were all illustrations in this edition), probably as a money-saving measure, so more copies of the popular book could be produced at less cost. This image was found here at Wikimedia, which mistakenly gives the year of this version as 1683. 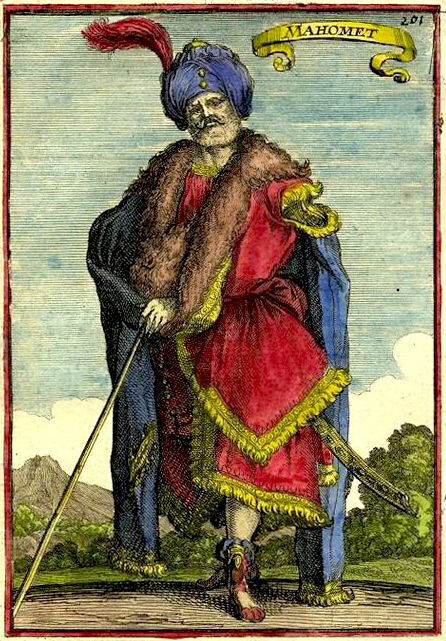 In yet a later reprint of Description de l'Univers (exact date not known, but likely 1700, as that is the publication year of the only confirmed edition not otherwise accounted for here), the portrait of Mohammed was altered even further: the image was reversed to be a mirror image of itself, and it was re-colorized. Finally, the 1719 German edition of Alain Manesson Mallet's Description de l'Univers featured this fourth version of the portrait, with a different color scheme and a few minor changes from the previous mirror-image version. The caption at the top in this German-language edition says "Der falshe Profhet Mahomet": The False Prophet Mohammed. 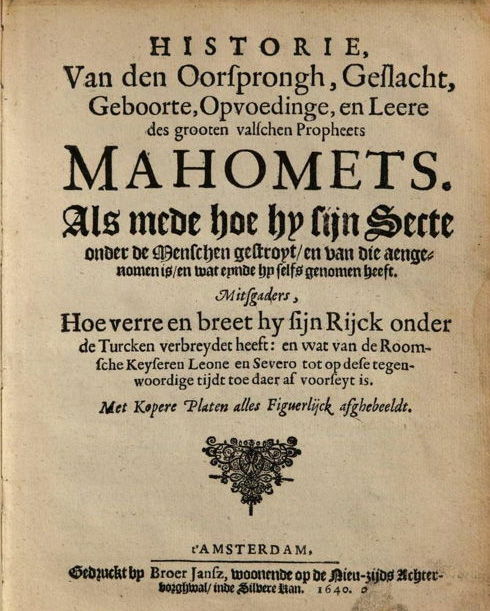 The Utrecht University Library hosts an online edition of Mahomet's Alkoran, a Dutch translation of the Qu'ran published in 1696 which also includes a variety of other material about the life of Mohammed and the history of Islam. Included in the text are seven copperplate engravings by Casper Luyken. 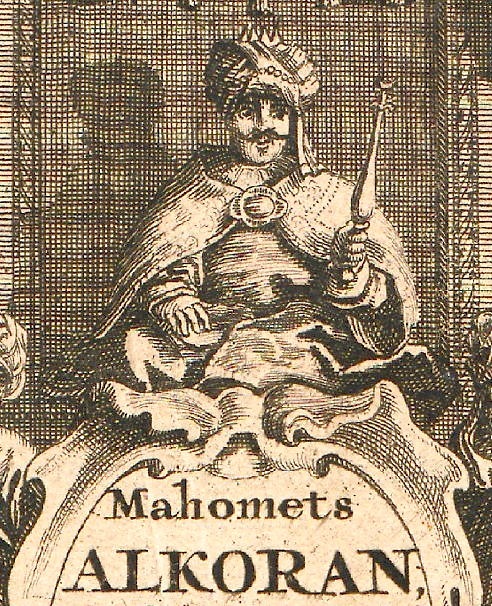 The first one, the frontispiece, shows a smiling Mohammed seated on a throne. Then, the first four actual illustrations in the book depict Muslims at prayer. Finally, the last two illustrations, facing pages 491 and 496, depict Mohammed having an epileptic fit (491) and then preaching to a crowd (496). All three depictions of Mohammed are presented here. 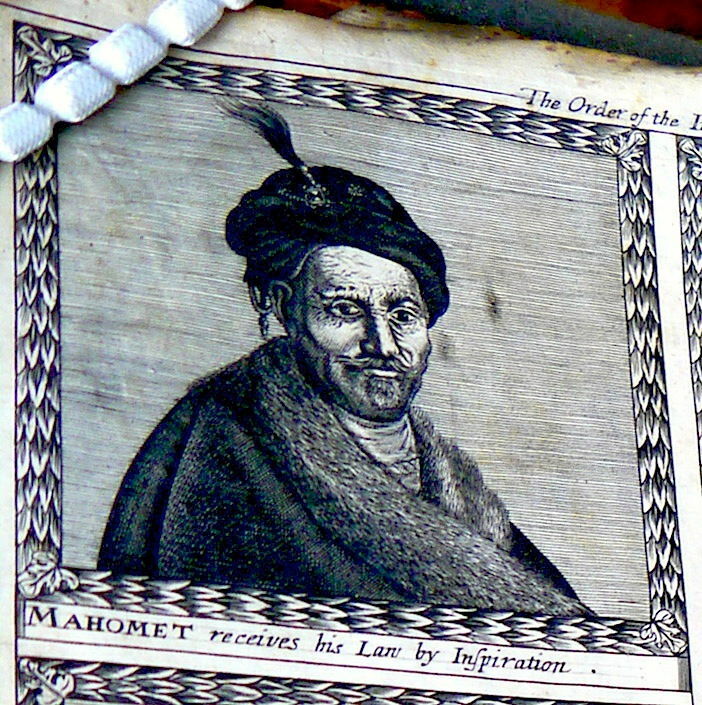 The full frontispiece, shown here on the left and visible at this URL, depicts a smiling Mohammed seated on a large throne behind the book's title; the image on the right is a detail of Mohammed from the full frontispiece. 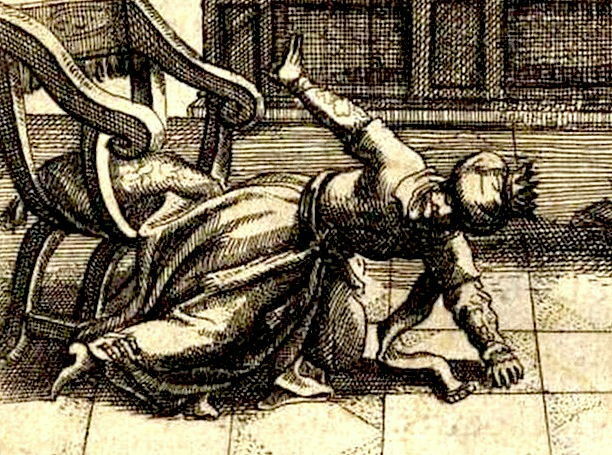 Facing page 491, in a section of the book containing a biography of Mohammed entitled "Mahomets Leven uit verscheide Christe Schryvers getrokken," and which condemns him as a fraud, is an engraving of Mohammed having an epileptic fit, during which he imagined he was visited by the Angel Gabriel. 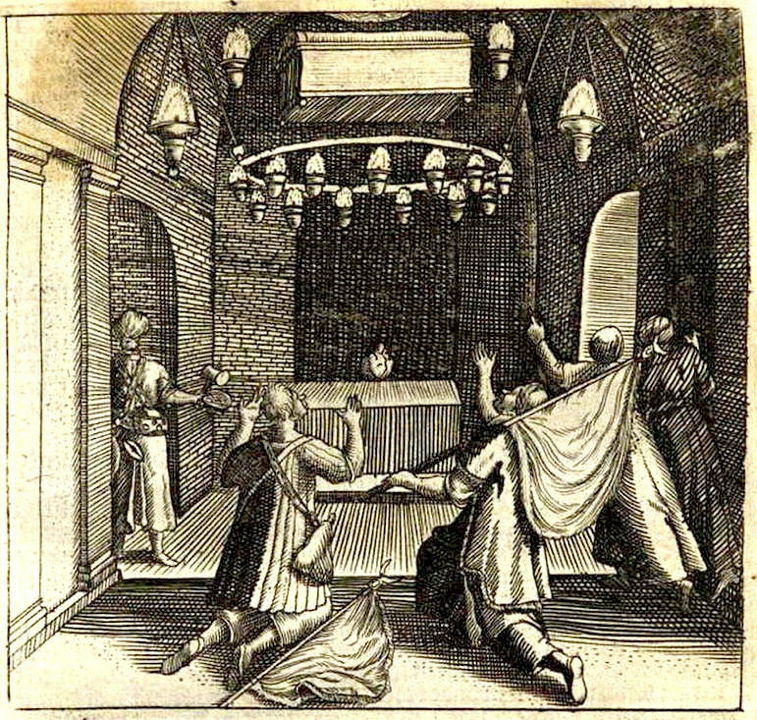 The library Web site's anlysis of the book states that this and the next image illustrate "anti-Islamic stories about the prophet Muhammad circulating in medieval Christian sources" which claimed that "the divine revelations which Muhammad received were merely delusions caused by epileptic fits." The first of the two images immediately above is the full page; the second image is a detail of just Mohammed. 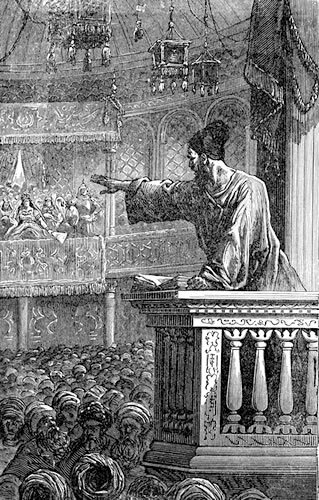 The book's third and final depiction of Mohammed shows him preaching to a crowd and/or receiving a book from heaven, a scene which according to the Utrecht University Library illustrates the biography's claim that "the miracles shown to Muhammad were actually staged by himself to fool the ignorant." The image on the right is a detail of the full page shown on the left. 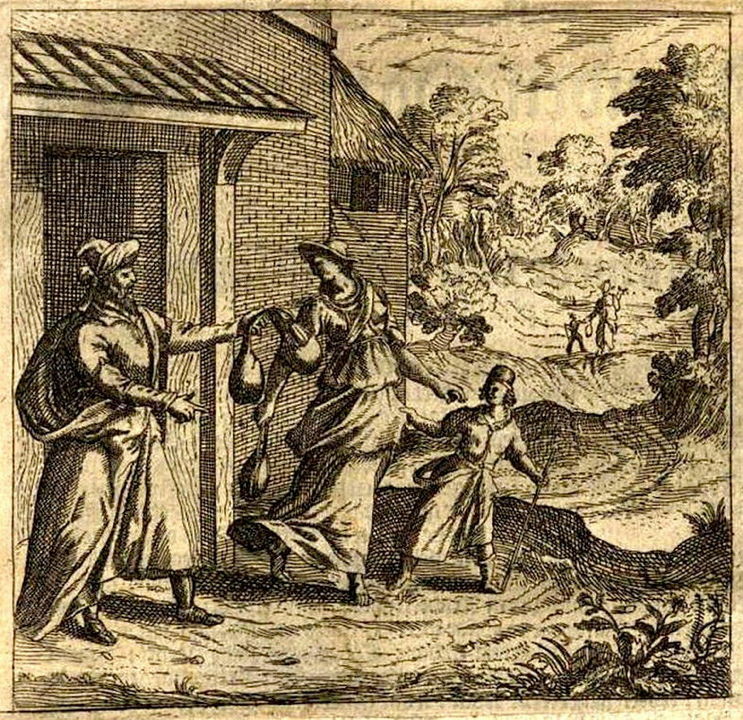 This illustration is taken from La Vie de Mahomet, by M. Prideaux, published in 1699. It shows Mohammed holding a sword and a crescent while trampling on a globe, a cross, and the Ten Commandments. 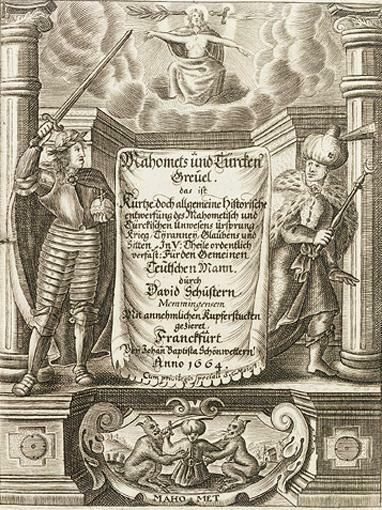 Frontispiece from The Life of Mahomet, by A. du Ryer (published by J. & B. Sprint, 1719). 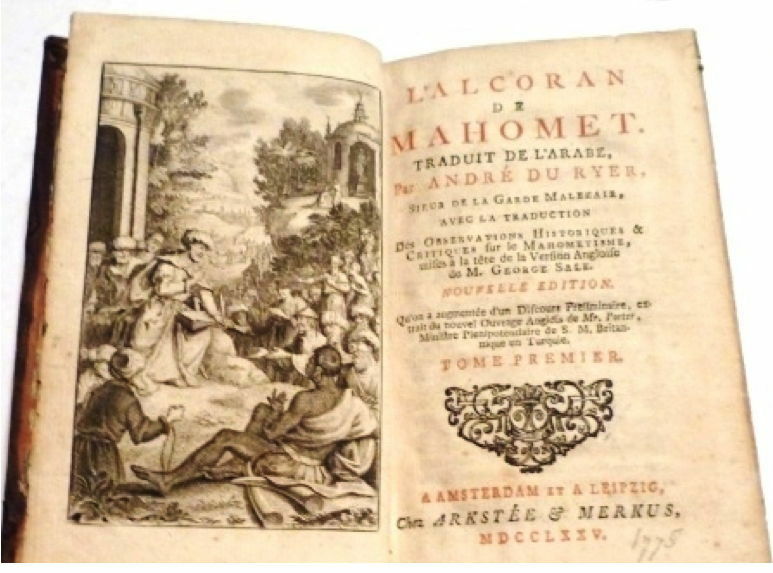 L'Alcoran de Mahomet, Traduit de l'arabe par André du Ryer, sieur de la Garde Malezair, avec la traduction des observations historiques & critiques sur le mahométisme, mises à la tête de la Version anglaise de M. George Sale, by the Sieur Du Ryer, published 1775. This is a later edition of the same 1683 translation noted above, but in this instance published in Amsterdam and Leipzig in 1775, with different illustrations and additional text, as described in the book's lengthy title. 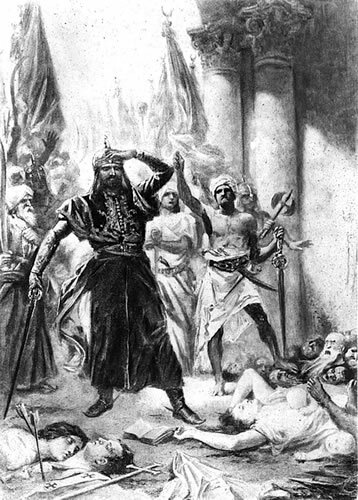 The frontispiece has what looks like an illustration of Mohammed preaching to a multi-ethnic crowd of followers from around the world in a distinctly non-Arabian landscape, but unfortunately the only photo of the page available online is fairly low-resolution; the image above is taken from this photo, which is part of a listing for the book to be sold by the Librairie Jeanne Laffitte bookstore in Marseille, uploaded to the livre-rare-book.com site. 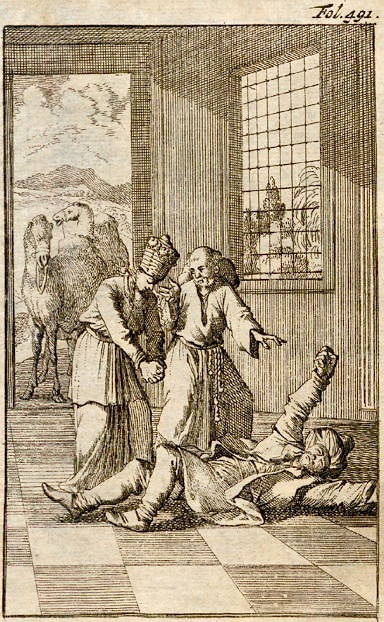 Illustration entitled "Death of Mahomet," a photograph of a page in the book The History of the Arabs, Including the Life of Mohammed, by William Mavor (published in New York in 1804). 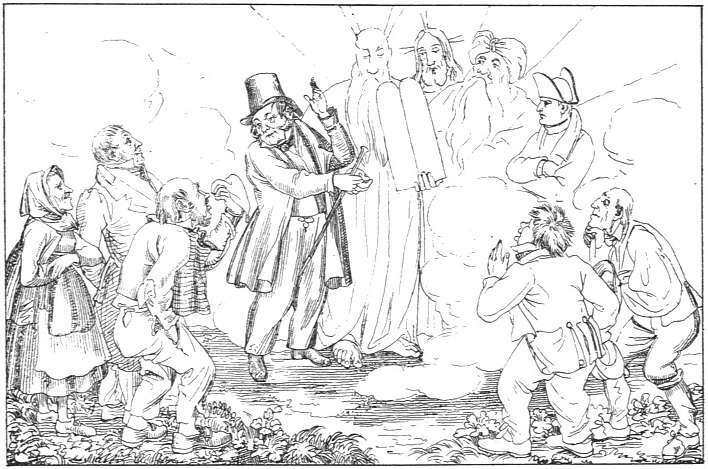 Satirical 1839 book illustration by the artist Martin Disteli showing a preacher introducing the four great men of history: Moses, Jesus, Mohammed, and Napoleon, published in the Swiss book Kurze und fassliche Beschreibung der Lebensgeschichte meines Herrn Vetters, by Peter Felber (1839). 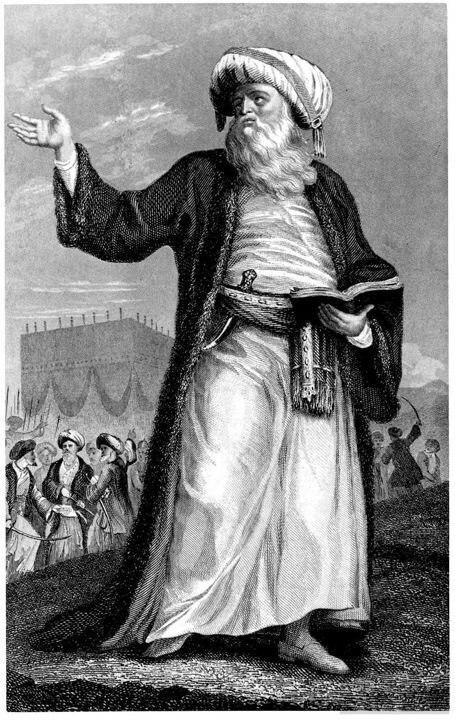 The left image is the frontispiece from the book The History of the Saracens: Lives of Mohammed and His Successors, by Simon Ockley (published in London in 1848). The caption below the drawing simply says "Mohammed." Behind him is the Kaaba in Mecca and a man wielding a scimitar. However, the right image purports to come from a 1901 edition of Life Magazine, even though it's obviously the same illustration. A possible explanation is that the engraving originally appeared in the 1848 book, and the image on the left above is a photograph of the page taken at an angle, causing the illustration to become distorted; and then 53 years later, the engraving was re-used in the magazine, and was subsequently preserved or scanned without distortion. 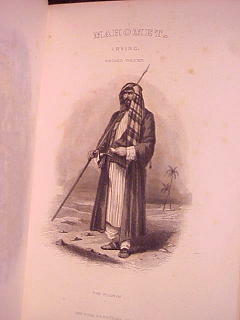 Portrait of Mohammed from the frontispiece of Washington Irving's Mahomet and His Successors (Putnam and Son, 1869). It was briefly listed for sale at this book collectors' site, but the listing has since expired. 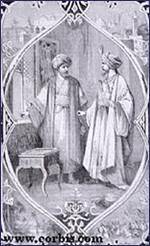 In 1831, an author with the surprising name of George Bush published a book called The life of Mohammed; founder of the religion of Islam, and of the empire of the Saracens. The original edition had no illustrations, but a 1900 reprint contained the fronticepiece seen on the left. 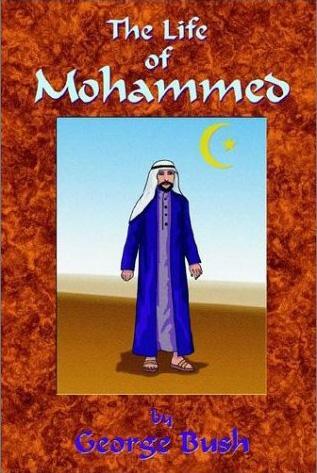 The book later entered the public domain, and was reprinted in 2002 by various small publishers with generic Mohammed portraits, such as the two pictures seen on the right. In 2004, the Arab media circulated a rumor that the 1831 George Bush was the "grandfather" of the American president George Bush, but that proved to be false. The U.S. government actually issued a statement about the case, which can be read here: they prove the rumor is false, but do say, "Two independent genealogies show [book author] Reverend Bush was the cousin of Obadiah Bush, who was the great-great-great grandfather of the current president. This makes the Reverend Bush a distant relative of the current president, five generations removed, but NOT his direct ancestor." You can download a pdf of the book at this site, and also download various other formats of it from the Internet Archive. The "Mahmud" in the verse is apparently a transliteration from the Persian referring to the original Mohammed, not some later historical figure named after him. 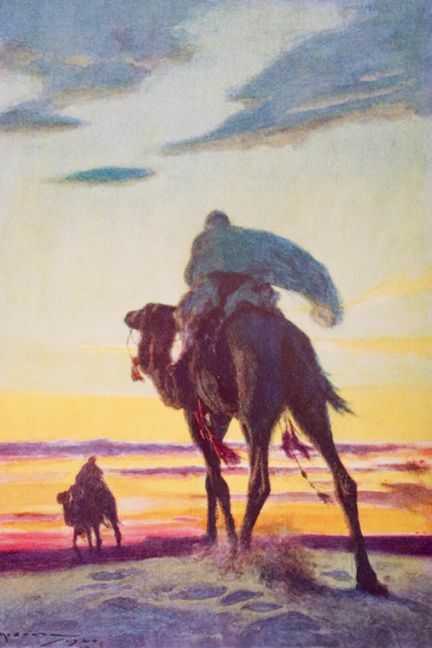 "The Flight of Muhammad to Medina," color lithograph by artist A.C. Michael, used as an illustration in the 1920 British book The Outline of History, Volume II by author G.H. Wells. Original in a private collection. 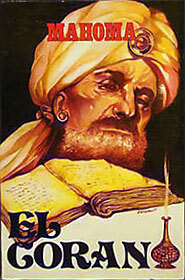 Portrait of Mohammed, from a 1932 Spanish edition of the Koran. It was originally posted on the now-defunct Faces of Mohammed blog. The exact spelling of the title is not known. This portrait of Mohammed from a Spanish edition of the Koran (different from the 1932 edition above), entitled El Coran, credited to "Mahoma" and published in 1979, was briefly listed for sale here on the Spanish version of eBay, but the listing has since expired. It's not clear whether the image depicts the cover of the book, or an inside illustration, or a catalog listing for the title. 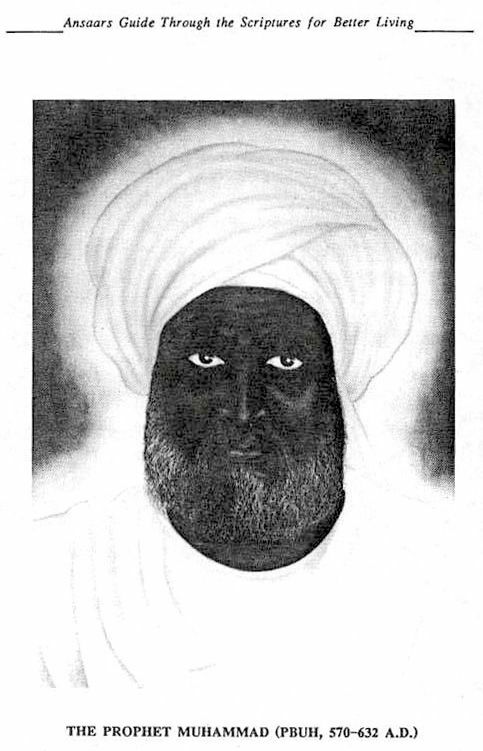 This unusual portrait of a dark-skinned Mohammed appears in a book entitled Ansaar's Guide Through the Scriptures for Better Living, published in 1988 by the "Original Tents of Kedar," an African-American Muslim organization. 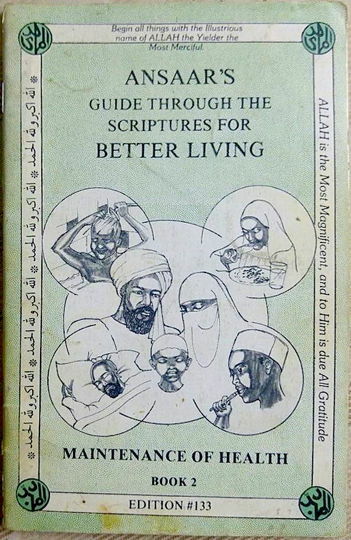 Ansaar's Guide is actually divided into "a series of pamphlets with information on such topics as health, purification, grooming, dressing, conversation, raising children, self-discipline and organization." The cover of Book 2, Maintenance of Health, is shown above on the right as an example, but it is not known which of the volumes contains the portrait of Mohammed shown on the left (or if all the volumes have it). The image seen here was originally posted at this Islamic site, but was later taken down. 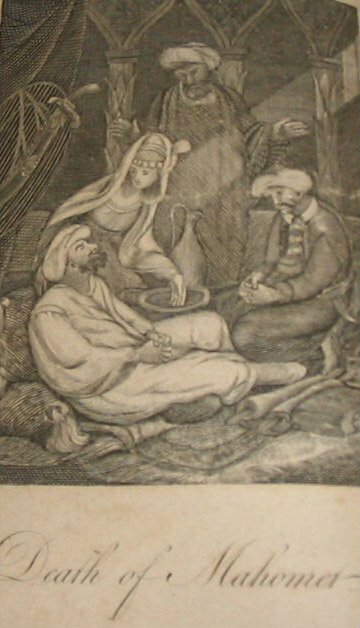 The book Der Harem des Propheten by Johann George Mausinger features this image among many others, mostly showing Mohammed in belittling or humiliating situations (here he is seen sitting on a monk's lap). The drawings are by Polish artist Maius Haban. If you have a copy of this book or know of a site featuring other examples of its illustrations, please send us the images. 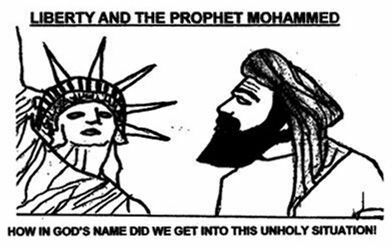 This sketch of Mohammed and the Statue of Liberty appears in the book Meg's Absolutely Wonderful Tremendous Fantastic Day/The Deafening Silence, by James O'Neill (2005). The following illustrations all originally appeared in books (as far as can be ascertained), but the attribution information for the images has been lost, so it is not known in which books they were published, nor in what years. Incomplete source information for each image is provided where available. 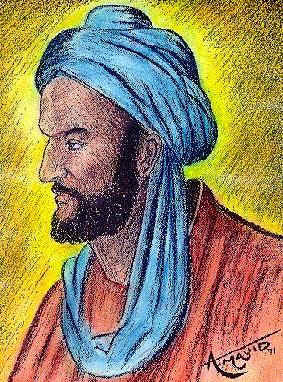 A charcoal and pastel sketch of Mohammed from 1971, apparently used as a book illustration, and reproduced on this page. 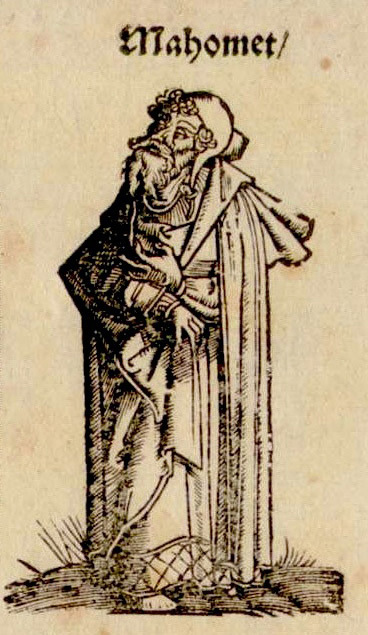 Contemporary rendition of what Mohammed may have looked like. Posted on this Spanish blog, but probably originally published as a book illustration. 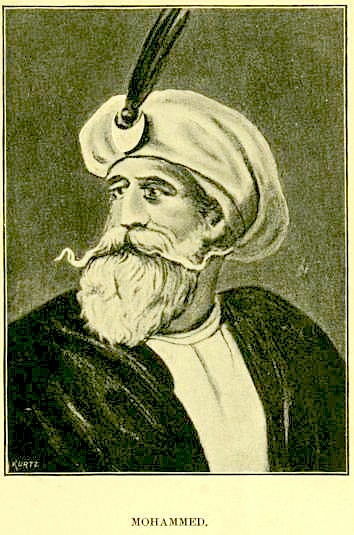 Portrait of Mohammed wearing an historically anachronistic turban, which likely originally appeared as an illustration in a book, title and date unknown. 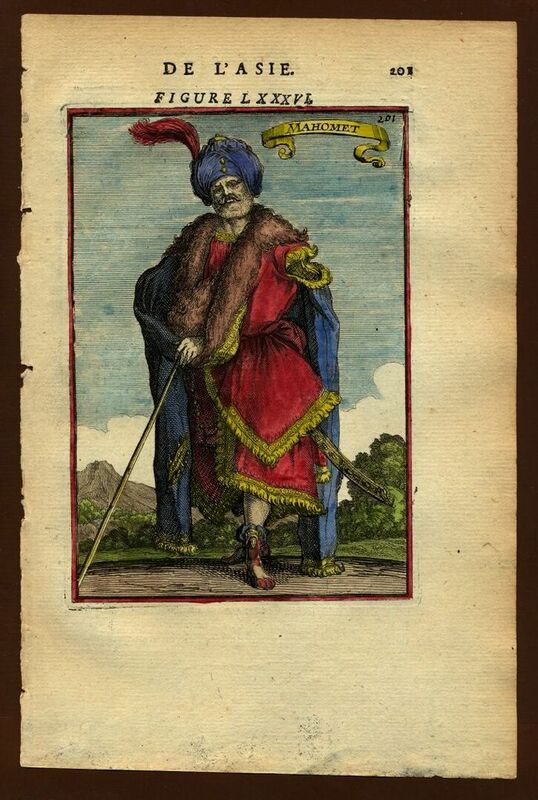 This image of Mohammed, probably from a 19th-century book about Islam, was posted at Faithfreedom.org. The name of the book in which it originally appeared, and its date, are unknown. 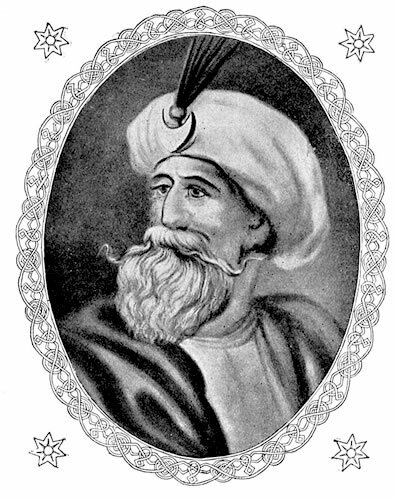 19th-century portrait claimed to be of Mohammed, which originally appeared in a book, title and date unknown. 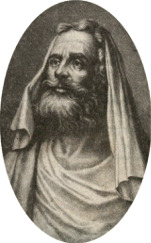 18th- or 19th-century portrait claimed to be of Mohammed, which originally appeared in a book, title and date unknown. 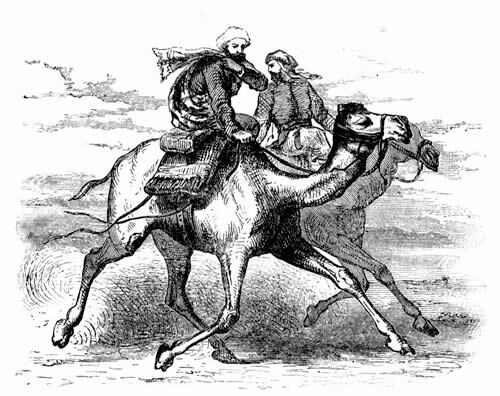 The About.com guide to agnosticism and atheism features a series of public-domain line drawings of Mohammed, eight of which are reproductions of Victorian-era book illustrations. They are presented below. 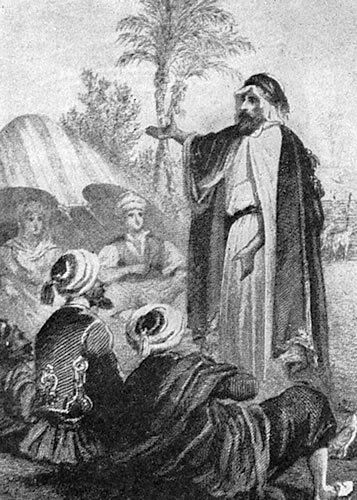 Mohammed preaching to early converts. From the About.com guide to agnosticism and atheism. 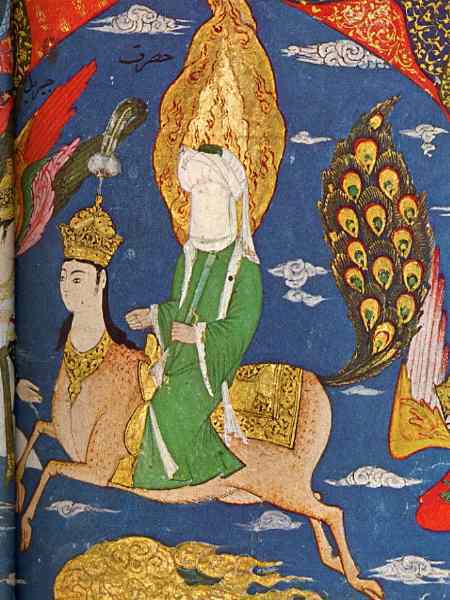 Mohammed riding a camel, mostly likely during his flight to Medina in 622 A.D., an event known as the Hijra or Hegira. From the About.com guide to agnosticism and atheism. Mohammed arriving at the walls of Medina. From the About.com guide to agnosticism and atheism. This drawing is titled "Muhammad Riding into Medina," but it's more likely that it depicts his triumphant return into Mecca. From the About.com guide to agnosticism and atheism. This drawing has the caption "Muhammad Leads Muslims in a Massacre," but it's unclear how definitive that attribution is. 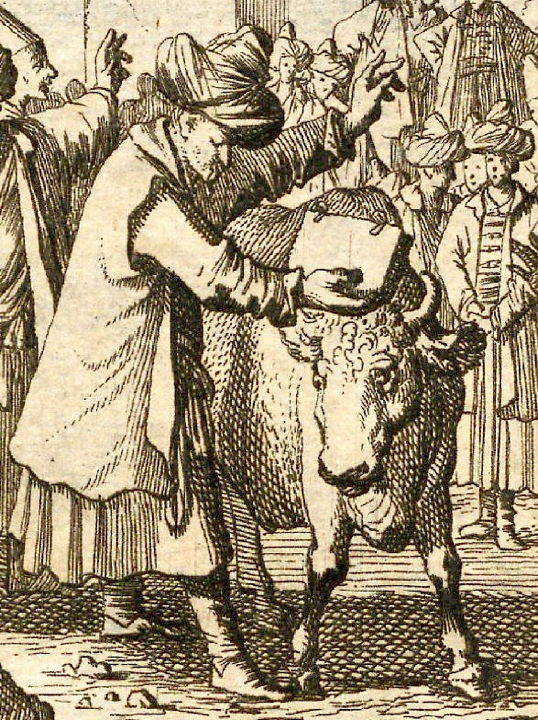 If the artist did indeed intend to draw Mohammed, then the scene was entirely an imaginary one, as the costumes and other details are historically inaccurate. Alternately, it's possible that the picture was misidentified, and shows a massacre of Christians by some later Muslim ruler. From the About.com guide to agnosticism and atheism. 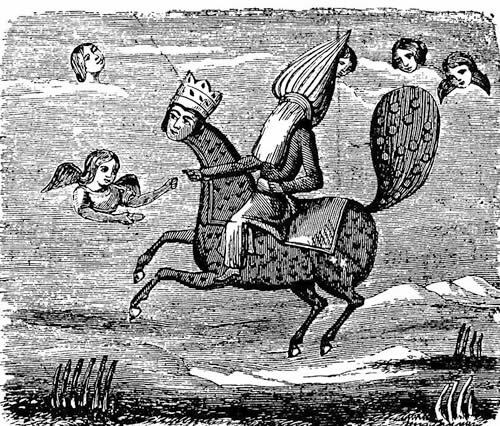 This intriguing Christian rendition of a faceless Mohammed riding Buraq into Paradise has Victorian-style angels surrounding him, in place of the traditional Biblical/Islamic angels. 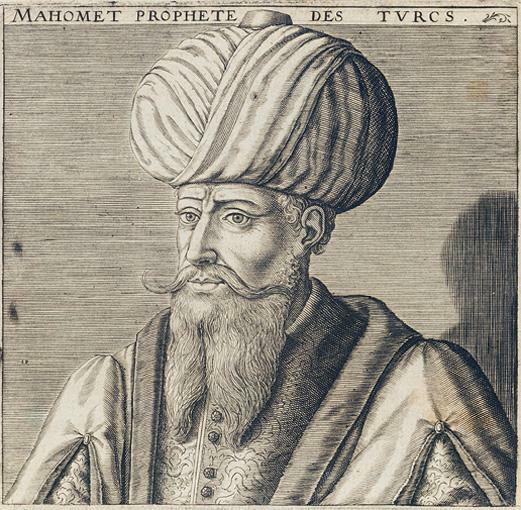 The artist obviously was referring to medieval Islamic depictions of Mohammed, but mistook the sacred flames surrounding his head (such as can be seen here, for example) as some kind of hat. From the About.com guide to agnosticism and atheism. Mohammed preaching Islam to his followers. From the About.com guide to agnosticism and atheism. 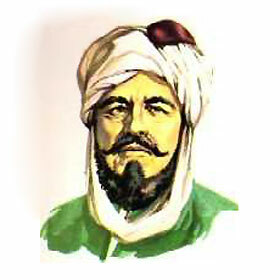 This mustachioed portrait of Mohammed likely dates from a late 19th or early 20th century book. From the About.com guide to agnosticism and atheism. This almost identical portrait, found on wikimedia, purportedly comes from a book or document titled "Great Leaders of History," although no book with such a title exists. The only clue as to portrait's origin is the signature "Kurtz" in the lower left corner. 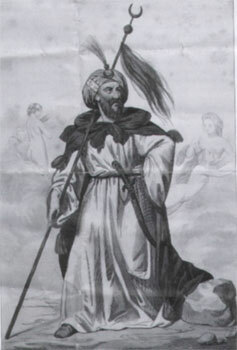 This illustration of Mohammed is likely the original basis of the previous image above.